GUEST ARTICLE: Surrounded by a ring of big and small snow capped mountains, Salt Lake City, Utah is a ski lover’s wonderland. Disembarking the Amtrak California Zephyr at Salt Lake City railway station in the early hours of the morning isn’t for the faint hearted. Call a taxi company like Yellow Cab (801) 521-2100 or City Cab Co (801) 363-5550 or you’ll be left stranded in a desolate part of town next to the very shady looking Pioneer Park. Entering the 800 South Guest House, amazingly enough located on 800 South (‘street’) is also an interesting proposition during the early hours of the morning. 800 South Guest House is a self-check in hostel with a cheerful yellow and blue exterior. Have the entry code handy from your internet booking to open the side door and a torch if the lights are off so you don’t have to stumble to the self check-in computer like I did. Starting at about US $20 for a shared dormitory, the hostel provides free secure WiFi, TV, kitchen and laundry facilities. It’s cheapest to book directly online through the official secure website. To stock up on the basics you can’t go wrong at the Walmart SuperCenter just a few TRAX stops away. If you can’t find what you want in Walmart, whether it’s a “wholesome” 😉 tube of cookie dough or “meal size maple pancakes” and sausage griddlecake, you just aren’t looking hard enough. 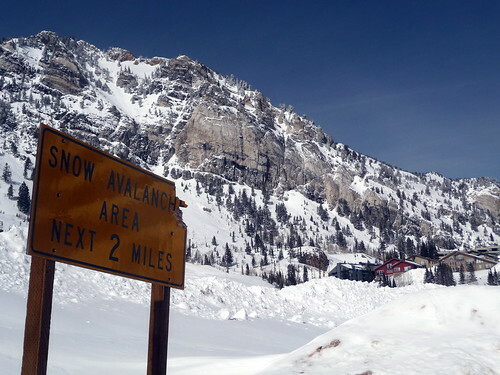 To hit the ski slopes, take a UTA ski bus up to Snowbird or Alta Ski Resort to experience the powder that made Salt Lake City home to the 2002 Winter Olympics. The champagne snow crumbles in your hand at the slightest touch. Snowbird is a more commericalised, larger resort with more eateries and shops. Alta is more of a smaller, simpler family run operation. But it’s really the types of runs on offer that counts. If you catch the TRAX light rail into town for sight seeing, be warned. There’s not too much to see by way of major tourist attractions, unless you’re interested in religious monuments and average museums. A ring of tall and short snow capped mountains provide a sparkling backdrop to what is other wise a fairly lifeless city. In early 2009, the city center was punctuated by construction works designed to breathe life and prosperity into the centre, its plain architecture and shady streets on its fringes. There are some chain restaurants like Romano’s Macaroni Grill where you can get a large cheesy mushroom ravioli and a Budweiser served with a complimentary warm bread roll and oil for about $US15. This article has been written by Pranav Bhatt. He is a graduate of the Faculty of Economics and Business at Sydney University. He has an interest in world travel, cricket, politics, technology and the media. Previous PostPrevious How Big A Mortgage Is Too Big in Australia?